Interesting sharing. I have same experience here. I know this is a little late, but may I know how much you spent approximately from Penang to the Hat Yai, including the insurance, toll and even petrol? I am sorry, that is too long ago. Toll and petrol might be around RM50. There are two types of insurance. I mentioned comprehensive insurance for your car in the article. You can possibly find out online the price of the compulsory Thai insurance. The Malaysian government is soon to introduce another new tax to enter Malaysia by car, of RM20 I believe. If so, the Thais may retaliate by doing the same. 1) Are there other border immigration points I can enter Thailand from? Or is this the only one? 2) After entering Thailand, where else would be feasible to visit (other than north towards Hat Yai) that I can drive to within 2 hours max? 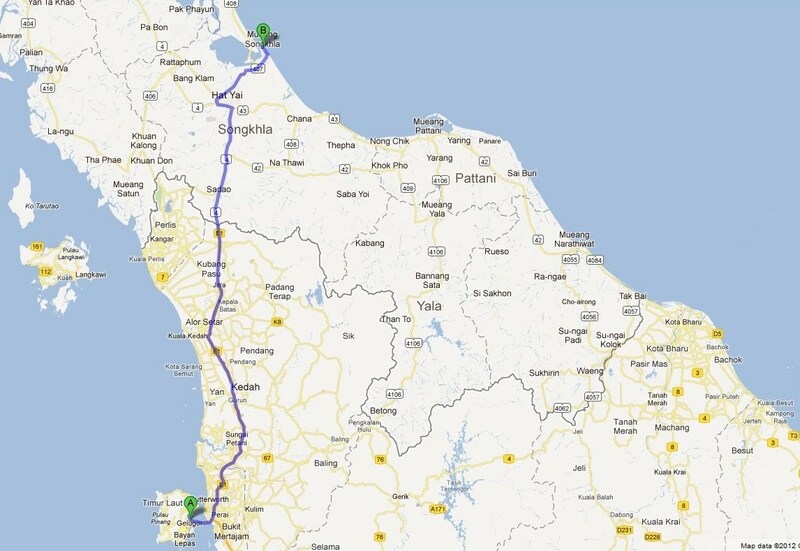 3) What is the nearest nice Thai beach that I could drive to from Penang? 4) Which hours are considered peak/off-peak if I am entering Thailand on a Sunday? It’s been quite a while since I have done that trip. I can’t really answer your questions well without doing the same research you could do. However, there is a border crossing further west than the main one on the North South motorway that I have heard of. The south eastern border states sometimes have terrorist incidents, so many governments advise not to visit. I went to Songkla, and the beach was quite nice, though. Thanks for your reply. I did come across through googling the other border crossing you mention (the one located in Perlis, called Padang Besar). However there’s little to no information about anyone using that – at least, for English sites anyway. So I was wondering how feasible (traffic, safety, etc) it is to cross there instead of the one at Bukit Kayu Hitam. I read that the queues can be horrendous at the Kedah border crossing hence was looking for an alternative. Any idea how safe it is to visit the southwest part of Thailand? I see that no one goes to the areas located in the southwest region and I wonder why. Is there nothing there to do/see or is it unsafe or something? Hi. I have a friend who regularly drives to Thailand, and is currently staying there. I have asked him by email, as I can’t really answer your questions myself. He doesn’t look at email so often, so it may take a while. Thank you so much for going to the trouble of asking your friend. My trip isn’t due till next month so there’s still some time. Your blog has been a good resource for me, as I’ve been thinking of relocating to Malaysia. That’s how I came across a few of your posts – while “doing research” (read: googling). Thanks for your encouraging comments. If and when my friend replies – he tends mostly to stay off the Internet while away – I’ll let you know. I think that Malaysia is a great place to live if you’re retired, or work remotely, and even more so since the government here changed about three months ago. smoother since the new facilities came into use. I expect it will be even better if/when they are ever finished. This time we were through both sides of the border in less than thirty minutes. enough crossing but a much longer drive from the North-South Highway and from the Thai main road to Hat Yai. side of the border, but it’s easy to get lost in Perlis (well, we did). The southern provinces which I consider to be unsafe and have not visited are Yala, Narithawat and Pattani. to be as safe as anywhere else. called Ao Thai at Sathing Phra on the east coast. It’s about 100km from the border. It has a website. used this crossing but not because of any safety concerns. Soon I’ll turn this reply into a blog as others may be interested. Thank you to you & your friend for the amazing reply! Lots of very useful information not found elsewhere on the Net! A very good idea to make this a blog post in its own right because I’m sure it’ll help so many other people! Thanks to the advice given, I’m now planning to go westward once crossing the border, towards Tarutao National Park and possibly also Ko Lipe (as suggested) if time permits. In which case it would make sense to use the westernmost Malaysia-Thailand border crossing, which I assume is Wang Kelian? Have yourself a great week ahead!